The Diesis vending machine is designed to vend a wide selection of bottles and cans, giving you control over what you stock, and giving your customers a variety to choose from. Available in a range of different sizes, with alternative layouts, you can choose how many of each drink type you want to stock, as well as which tasty cold beverages you’ll offer up to your customers or staff. There is even the option to get a custom fit accessory that will optimise the machine for thinner cans. With so many options for customisation, this really is the floor standing vending machine for companies that know exactly what they want – and it is compatible with most bottles and cans available here in the UK. 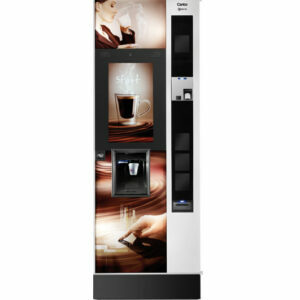 With an attractive and stylish front panel, the Diesis floor standing vending machine stands out from others on the market. The use of a wide photographic panel sets it apart from other similar models, so that it will be an attractive addition to any workplace or hospitality environment. NECTA’s design team have also focussed on reducing size without having a negative impact on storage capacity. This is great for companies that are worried about space, but don’t want to compromise on selection. You’ll also find that the attractive metallic interface is easy for users to interact with – so quenching their thirst never has to be a frustrating experience. 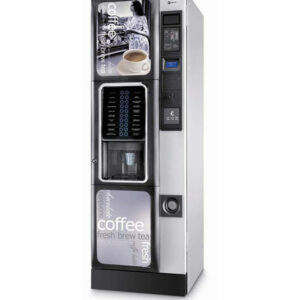 The Diesis vending machine is part of a wider range of NECTA machines, and the technology makes it easy to use alongside other models including the Opera coffee machine and the Tango snack vending machine. With a master/slave system that allows the Diesis machine to communicate with these other models, having a variety of different machines has never been simpler. 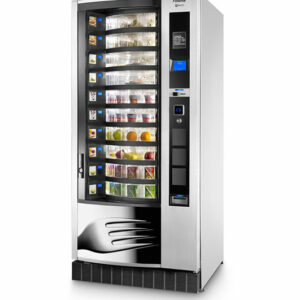 Setting up a collection of matching vending machines is a great idea for businesses that are choosing to use these machines as an alternative to a more traditional kitchen area, as it ensures that staff will always be well-looked after, well-fed and well-hydrated. 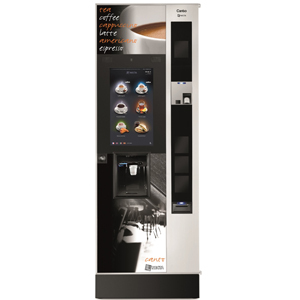 Similarly, those in the hospitality industry – such as hotels – may want to offer their clients a wider selection, so combining the Diesis drinks machine with options for food and coffee ensures that everybody is satisfied. This certainly isn’t a lightweight machine – instead, it is strong, sturdy and well-equipped for use in a fast-paced environment. It comes equipped with excellent internal technology, including an electronic temperature system that keeps your drinks chilled while also maintaining a quiet operation. The graphical display is designed to make it easy for customers, while the build of the machine – including a lighter weight for easier installation and moves, and fixed columns to help with changing stock – is made with your frequent use in mind. 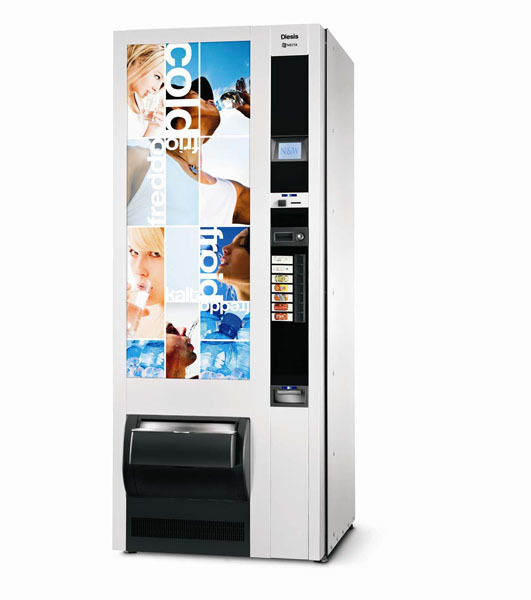 The Diesis model is part of a new wave of modern vending machines that give users access to contemporary models that are great to look at and even better to use. Machines like this one are changing the market by making it easier than ever for corporate and commercial clients to satisfy their customers and employees, and we’re delighted to be offering exactly that right here at Forward Vendors. Offices can make great use of the Diesis vending machine, as it ensures that staff can stay hydrated throughout the day. 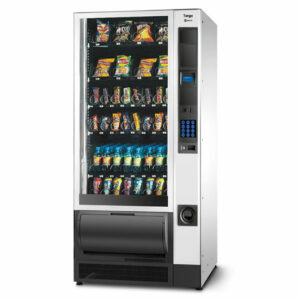 This is absolutely vital if you want to ensure that your workforce is healthy and energised throughout the working day, and the efficiency of this floor standing vending machine limits the costs to your business. It is also a perfect option for locations such as hotels and gyms, that want to look after their clients well without installing a kitchen or having a need for constant staff presence. So, however you intend to use it, why not contact Forward Vendors at 01371 859599 or sales@forwardvendors.co.uk today to find out more?